Vague pitches rob your query of its power. Don’t waste your precious 140 characters with these dead weight phrases. Using conflict to tell your character’s story will help propel the reader forward. No conflict, no story. This week’s shredding was one I actually completed a few months ago. It was outside my usual genre, but the author had started his approach by telling me how much he loved the blog, and I always feel the need to reward good behavior, that and after editing so many queries for the summer contests it had been weeks since I had gotten my claws into an actual story. It was a self-published story and the author wanted to know if there was anything he could do to improve sales. Once upon a time some happy children met a magical wishing troll and all their dreams came true. The end. Stories have to have a conflict. Without conflict, there’s no tension, and, frankly, no reason for anyone to read your story. If you want someone to be interested in your characters, they have to wonder what will happen to them. The children in this story had no problem to be solved, no difficulty to overcome. They didn’t grow emotionally or change a mistaken belief. Conflict is the essence of the story. When I pointed this out to the author, he challenged me on the point saying that children prefer stories that are more gentle in nature. I went to my daughter’s picture book collection and analyzed the results for myself. Conflict is the essence of the story. My daughter has over 200 picture/board books, removing those that are non-fiction, nearly every single one of them has a definable conflict. The main character wants something, but something else stands in the way. The mouse gets a cookie, but he’s never satisfied. Baby lama doesn’t want to go to bed, The bunny wants to run away, but mama always comes for him. The pigeon wants to drive the bus. There is no need to resort to monsters, villains, or fear. Conflict can be very subtle and still be effective. In my current favorite children’s book “Barnacle is Bored” The barnacle does nothing in the book but whine about how he’s bored. His conflict is mental and in the end, he changes a mistaken view. What is standing in her way? Right now, I want to get this article finished, but Facebook is standing in my way. Can I overcome my own tendencies toward distraction to complete it? Michele types happily at her keyboard, her phone blissfully forgotten. Did those toys I posted on that swap site ever sell? They’ve been listed for hours. Maybe I priced it too high. I should check on it. Dammit Facebook. I have to get this article written. It’s Nano and I haven’t done anything. I am so far behind. Oh crap, I’m supposed to update Wattpad too. That’s it, no more phone. I slap it back on the table and hide it under a stack of papers. Clickety clack, I’m finally typing again. Two minutes later, the phone dings. While this is rough, it illustrates how the most mundane moments can be made more interesting by adding conflict. Life is a series of conflicts. We move from one longing to another constantly. The Buddhists call this the condition of Samsara. We always want something, and once that is resolved we immediately move to another desire. Use this tendency to propel your fiction forward. Picking out your character’s main conflict is simple, but what are the mini-conflicts that come up on the way to the main goal? These are the building blocks of your scenes. 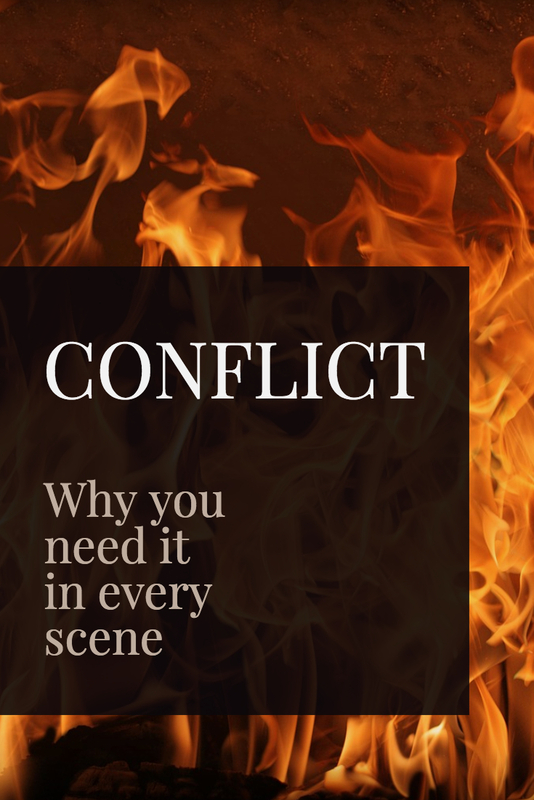 Using conflict as the basis for your writing will also deepen your characterization. In our phone example, the main character could solve her problem in a few different ways. She could turn the ringer off, or she could smash her phone against the wall. How she responds to the problem become the means for showing her characterization. Conflict is a great method for world building. Paint your character’s universe through his difficulties maneuvering through it, and avoid the dreaded info dump. Ex. Your MC needs to get to work but the space cruiser won’t start, and he can’t call a repair bot because he forgot to charge the iChip in his brain. An entire setting drawn through conflict. No info dump necessary. Conflict is more that defeating the villain. It is the method for telling a character’s complete story, for drawing their characterization, and for building their world. Life is a series of conflicts, large and small. Take your readers through your character’s conflicts and they will live your character’s story. If you enjoyed this article, please share it with other writers on social media or pin the image below. Thanks! Let The Manuscript Shredder help you with your next project. Pick up a copy of Your Novel, This Month today!